Staff Outsourcing is a managed outsourcing service. We help businesses from around the world reduce overhead, complete projects and extend their companies overall output by providing a scalable workforce. Whether it be customer service, web design, graphic design, web programming, accounting and many more, we have a service that can help your business right now. Whether you are large corporation or a small business we have a solution that will fit with your business plan. 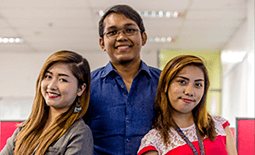 Staff Outsourcing is headquartered in the Philippines. With multiple offices in Cebu and Manila and we have access to a large pool of employees with a wide range of skill sets. Staff Outsourcing Solutions operates on the fundamentals of our core values. They define who we are as a company, what we can contribute and what we can deliver to the highest standards. The Philippines was ranked as the highest number of workers in the call center industry and has grown annually every year by 46%. It’s because the Philippines has a strong connection to western practices and culture. StaffOutsourcing.com was founded out of necessity by our parent company Sound Connection. Our parent company is a leading e-commerce company with over 25 million in annual online sales. Our Facility is equipped with the latest state of the art technology, and we provide the tools needed for all agents to succeed. Staff Outsourcing made the commitment that our office would be ran in western environment that focuses on quality, rather than output.